Officer James Manor was killed in a collision when vehicle turned in front of his patrol car, causing a head-on collision. Officer Manor was responding to a domestic disturbance call, but did not have his emergency equipment activated, when the crash occurred on Flamingo Road. 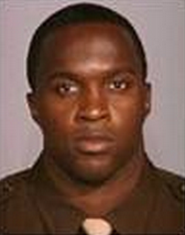 The officer had served with the Las Vegas Metropolitan Police Department for two years. He is survived by his 4-year-old daughter.